We have all heard of cataracts and most of us even know someone who has undergone surgery to remove them, but what exactly is the story behind this common eye disease? 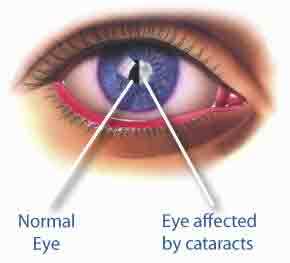 A cataract is the clouding of the eye’s natural lens. The lens works on basically the same principle as that of a camera lens, allowing light through and focusing it on the retina. The lens is made up of mostly water and protein and as we age, the protein starts clumping, causing cloudiness in vision. This clumping of the protein is effectively the cataract. These can form in both eyes, although the condition often occurs earlier in one eye than in the other. It is still not clear why this clumping occurs. Scientists have suggested wear and tear, some have established links between cataracts and diabetes and smoking. Research to find the cause is ongoing. Regular eye exams are important, as often, early detection of a problem gives you a greater chance of recovery. Unfortunately there is currently no medical cure, except for surgery, or any aid to prevent occurrance. Protecting your eyes from UV light with a decent pair of sunglasses can limit the damage that UV light causes, aiding in prolonging the health of your eyes. Cataract surgery is one of the most common medical procedures performed today and more than 98% of these surgeries are without complications and more than 95% of patients have improved vision after surgery. 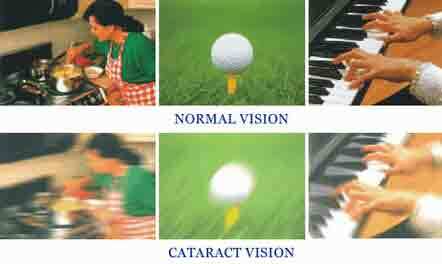 Regaining eyesight after cataract surgery ranges between 20/20 and 20/40. Surgery is usually completed in less than an hour. During surgery, the surgeon removes the clouded, natural lens and replaces it with a clear, plastic intraocular lens (IOL). In the event of both eyes needing surgery, it is preferable to do only one eye at a time and delay the surgery for the second eye with approximately six to eight weeks, allowing the first eye to heal properly. Before surgery, your eye care specialist will do a series of tests and take measurements to ensure the right fit for your intraocular lens. It is important to tell your surgeon what medication you are on, if any, as this might have an effect on the success of the surgery. Surgery is painless as it is done under local or topical anesthetic. During preparation for surgery, you will be given eye drops to dilate your pupils. The surgeon will make a small incision on the side of the cornea through which he/she will gain access and remove the clouded lens and replace with the new. A gel-like substance is injected into the eye to stabilize it during surgery. Using an ultrasound like instrument, the surgeon ‘breaks down’ the clouded lens and using the same instrument’s suction, he removes the broken down lens. The intraocular lens is then put in place. Generally the incision made is self sealing, but in some extreme instances stitches is needed. These stitches rarely need to be removed. The surgeon will cover the eye with protective dressing and for a few days after the surgery, you would need to administer eye drops a few times daily. Some liquid discharge, swelling and discomfort may be experienced a few days following the surgery and is normal. Avoid any strenuous exercise, heavy lifting and ensure that your eyes are not in contact with dust or water as this might cause infection. You should wear sunglasses or a protective shield as the eye might also be sensitive to light and touch and make sure that you go for a check-up with your specialist. Your vision might be a bit blurry, but your eyes will soon adjust and you will regain clearer eyesight within a few weeks.